Rare’s creative director, Gregg Mayles, has been going through the company’s dusty drawers pulling out old design documents to share on Twitter. So far a lot of his reveals have been focused on the Banjo Kazooie games but last night he confirmed that Rare had planned a spinoff to Perfect Dark. It looks like it would have followed Joanna’s sister, Velvet. In Perfect Dark’s co-op mode on the N64, the second player would take control of Velvet. She was essentially a re-skin of Joanna, to the point that if the player in control of Velvet completed a level’s final objective she would replace Joanna in the next cutscene, speaking Joanna’s lines. However, Mayles’s tweet confirms rumours that the team was working on a newPerfect Dark game (prior to the one later released on Xbox 360). Back in February, 2000, IGN spotted that Rare had registered thewww.velvetdark.com domain name. Rare was thought to be developing games for Nintendo’s ‘Dolphin Project’ (what would become the GameCube) so it was suspected the site was a sign of a new Perfect Dark game. 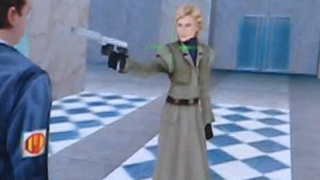 At the time, Nintendo World Report thought that Velvet was a code name that referred to Joanna (this was at a time when Joanna’s sister’s name wasn’t known; Velvet’s name doesn’t appear in Perfect Dark). Mayles’s tweet last night suggests that it was a game about Joanna’s sister. We can’t learn much about the game from the document Mayles tweeted. The standout feature is the “Serum Abilities” and ‘Serum Background” sections. It sounds like whatever it was it was going to play a big part in in the game. Although the reference to ‘Game Boy Advance compatibility’ is also interesting. Plus, in a later tweet, Mayles recalls that Velvet Dark was aiming for an N64 release. This stands out particularly because the design document is dated as October 30th, 2000, less than a year out from the GameCube’s eventual release in September, 2001. I’ve contacted Rare to see if anyone can expand on the plans for Velvet Dark.